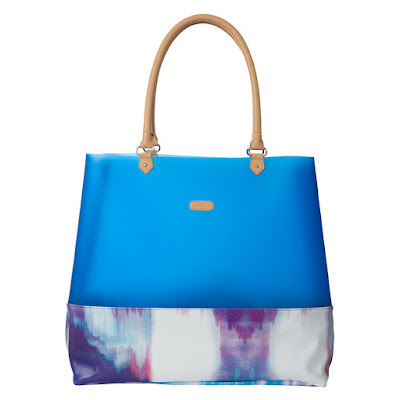 Blaire Beach Tote – This super-roomy tote has plenty of space for everything you need at the beach or pool. Blaire also makes an excellent travel bag, car tote or even a stylish eco-friendly shopping bag for quick trips to the grocery store. Translucent jelly sides in rich Mediterranean blue are complemented by sturdy faux leather accents featuring a custom watercolor print. Comes with rolled handles and silver hardware. The inside bottom is lined with bold purple fabric. Bag is completely self-contained, it is not interchangeable like our traditional bags. Tote dimensions: 16 ¾”long x 15 ½” tall, with a generous 6” gusset. Handle dimensions: 22 ½” x 5/8”, with a 9 ½” drop. Spend $50 (before tax & shipping) and get the Blaire Beach Tote at 50% off!